The cherry blossoms are about to burst! Once a year Vancouver's streets erupt with shades of pink as the cherry blossom trees begin to bloom. Cycling below the canopy of pink blossoms is not only the perfect way to celebrate the arrival of spring but it can be quite a breathtaking experience. Vancouver’s love affair with these flowering trees began when the Japanese cities of Kobe and Yokohama provided the Vancouver park board with 500 cherry blossom trees in the 1930s. These were to be planted in Stanley Park's Japanese cenotaph to honour Japanese Canadians who served in the First World War. Today, the city’s streets are lined with approximately 43,000 cherry trees. You can learn more about the history of Vancouver’s Cherry Trees here. During March and April, getting around by bike is the perfect way to experience these beloved trees. You can follow our Blossom Bike Ride Map below which will take you through streets awash with colour. 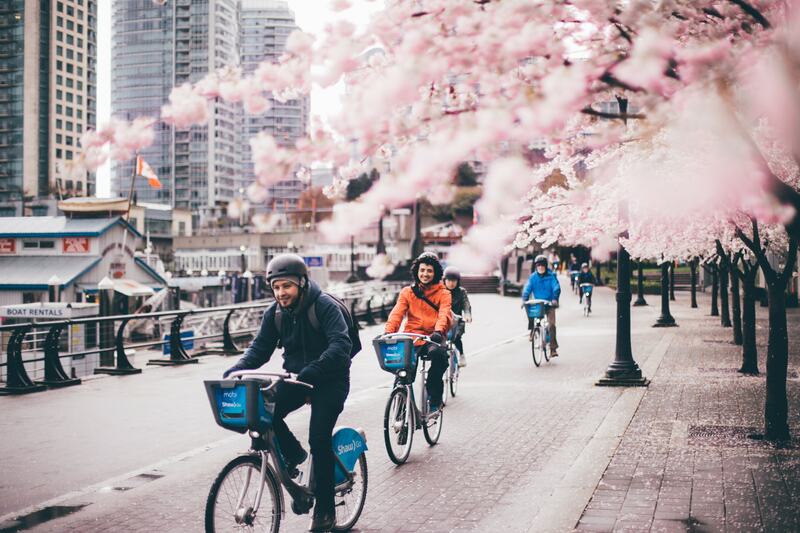 Pick up a bike from a nearby Mobi by Shaw Go station and ride among the blossoms. Remember to keep your eye on the bike's timer by hitting “enter” to avoid overage charges. There are plenty of docking stations in the area where you can lock your bike before you exceed the allotted ride time included in your Mobi by Shaw Go pass. Capture a great photo during your ride? Use the hashtag #mobishawgo to get featured.